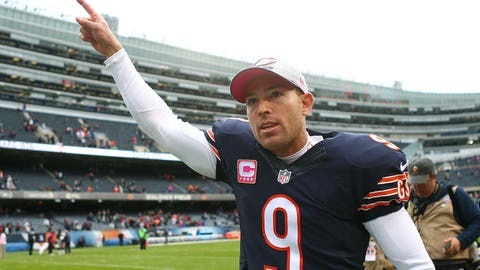 Kicker Robbie Gould delivered the Bears their first victory of the season. Break out the hardware for Chicago Bears kicker Robbie Gould. After a three-field goal performance against the Oakland Raiders in Week 4, Gould has been named NFC Special Teams Player of the Week, according to Kevin Fishbain of Chicago Football. Gould overcame an early miss on an extra-point attempt to convert field goal tries from 19 yards, 49 yards and 54 yards out. The 49-yarder was a game-winner that passed through the uprights with just a couple seconds remaining. When the Bears can’t find the end zone, they’ve got Gould to bail them out.